Samsung will release the 5G model of the Galaxy S10 in Korea with the "X" moniker on March 29, claims local media today, and at a starting price of about $1424 in local currency. 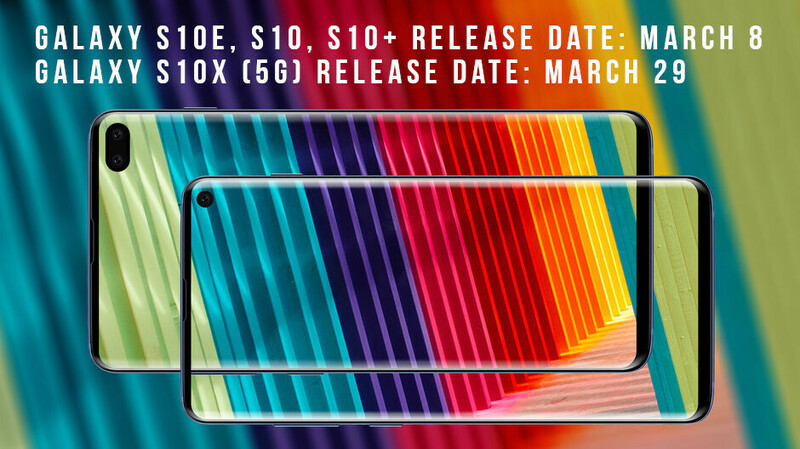 The Galaxy S10 E, S10 and S10+, on the other hand, will be released on March 8 there, starting at about $700 for the cheapest model. How is the double difference in price between the least expensive S10 E and the most expensive S10 X 5G justified? Well, the Korean publication reiterates that we will have six cameras in total on the 5G model - four at the back and two in the front - as well as 10GB RAM and up to 1TB storage. So far so good, we've heard such jaw-dropping specs mentioned before but what caught our attention was the eventual 5000 mAh battery capacity listed in this latest rumor installment for the Galaxy S10 X. That's way more than the rumored 4000 mAh piece in the S10+ and would be the largest battery Samsung has placed in a flagship, but then again the model has to cope with connecting to a 5G network and will sport the largest, 6.7" display, in the upcoming Galaxy S10 model family. The other new bits of info about the most souped-up and most expensive Galaxy S10 model is that it will sport Samsung's new Exynos 5100 5G modem on the hardware side (what else). When it comes to software features, the S10 X might adopt something called "Life pattern" (working title) that learns and seamlessly adapts to your usage style, trying to automate everyday tasks you do with your phone. As to why only in South Korea at? Well, that country is shaping up to employ 5G on a national scale first in March, hence the Galaxy S10 X exclusivity there. Fret not, though, this puppy will be coming to the good ol' USA before long, too. The price madness continues. No phone is worth 1400USD even though I am sure that Samsung will offer excellent hardware. Not sure if buying 5G will make sense this year. Limited network availability and very high phone prices and I don’t see the emmediate advantage of 5G over LTE under the condition that you live in an area with good to very good LTE coverage. I'm sure buying 5G won't be worth it this year. Or next year. It took years for LTE to be worth it, it's going to take years for whatever 5G's code name is to be worth it. Better off buying a Moto Z3 with the 5G mod. Glad I have one as my backup phone. This gon sell like 7 units. My $900 Note 8 dropped about 16 to 18 inches onto concrete and the whole front screen cracked. It was devastating to see $900 shatter so easily. I wouldn't want to carry a similarly fragile $1,400 object with me. Just not worth it for a phone that fails and/or gets replaced every year or two. At least it's the first 5G phone on the market. And I'm sure that it's price will go do in time. $1600 ain’t bad for 1tb. 1600 is awful for ANY phone with ANY capacity. You need to reevaluate your spending habits. Why are you worried about how he spends his money? If he has the disposable income to spend on a phone like this, what do you care? Because salt is delicious. Deal with it. Thank you for that. Agreed 100%. I generally buy the Note series, if I was in the market for the S, I would also get the lowest priced S10+. LOL at paying $1400 for a phone that will be obsolete after 12 months, and stopped being supported after 24 months. If you really think a phone like this will be obsolete after 12 months, you're brainwashed like so many others. Just because a new version comes out, it doesn't make the previous version obsolete. Also, these phones are being supported for 36 months, not 24. They get OS updates for 24 months. That being said, I wouldn't spend $1400 on a phone either. Just not worth it. The laptop I bought 8 years ago still receives software updates from Microsoft (full disclosure: I did buy a license for Windows 8, back when a free upgrade to 10 was offered). I paid ~$1400 because it was a higher end gaming laptop. I'd like to see what the S10 is like after 8 years. Either way, my comment still stands. Samsung will mostly forget about this phone after the next generation of S comes out. Security updates will be less frequent compared to the newest version and OS updates will lag months behind the latest phones. You're comparing a laptop to a phone. That's your first mistake because one is clearly made to last a lot longer than the other. Also, your second point doesn't stand because every generation of S has received an OS update after the next one came out, so they clearly weren't forgotten (even though, admittedly, they were put on the backburner). It will be obsolete after 6 months after Note release. Go home you drunk ! Holly cow! $1500 for a phone? that's insane. Hope the larger battery isn't to offset 5g having more power draw, first generation LTE devices were HORRIBLE. Wrong comparison. Even if dslr sensor is better, you can't play music, browse internet, store office files, make text and calls, play games or organize schedules in your dslr. Most casual users don't care owning a dslr, people buy phones for the over-all usage. This is ridiculous! Only apple can charge more than $1000. Android just sticks to $699. They’re all garbage. Apple is the only premium phone ever. They can charge 1000 dollars but just like every S series phone, it'll be selling for 500 within a year. why would anyone buy that when the technology won't be up and perfected til 2025? NEXT !